Ever since I bought my first e-reader, I have never stopped following the rapidly evolving industry. 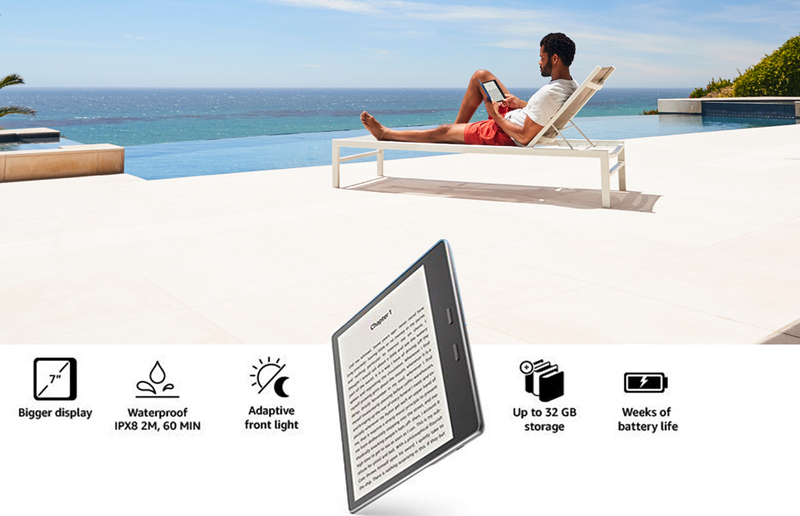 I was thrilled when I heard that Amazon’s new e-reader, Amazon Kindle Oasis, was bigger and water resistant. If you have children at home, you will understand why I am excited about this news. I have lost count on the number of times I have either changed my smartphone or take it for repairs because my daughter dropped it in the pool, spilled water on it or smashed it on the floor. My daughter is three and I love her so much. So, no matter how angry I may be at her actions, I still forgive her quickly. Her playful nature is one of the reasons I stopped letting her stay in my room whenever I was not there because she will either rip a page off one of my books on the shelf or get them wet. Besides this, another reason I now go for ebooks over traditional books is because of storage space. Ebooks have a lot of advantages over traditional books and I have highlighted a lot of these advantages in my previous post. The Amazon Kindle Oasis, according to the manufacturers can withstand immersion in water up to a depth of 2m for 60 minutes. The device integrates ebooks and audiobooks. To ensure undistracted listening to audiobooks, the device also has Bluetooth connectivity for pairing with wireless speakers or headphones. It has a seven-inch screen and is also the highest resolution with 300ppi screen density, meaning we can fit around thirty percent more words on the screen per page, which means customers have to turn fewer pages. Amazon was also able to solve one of the persistent problems faced by e-book readers, low battery life. The older Kindle Oasis, you will need to attach a magnetic case to extend the battery life. The new device has a built-in battery that lasts longer while maintaining the device’s tapered end at 3.4mm. How The New Device Affects User Experience? First, I would admit that the Amazon Kindle Oasis feels less bulky than I had imagined after going through the reviews. The tapered section makes orienting the grip easier and to some extent, brings back the feel of holding a real book. The Amazon Kindle Oasis is coming ten years after the first Kindle device. Although users had to wait a decade to have a water-resistant device, Amazon justifies the wait with a number of perks to the new device. For example, the LED light is more evenly distributed, it has a bigger memory (8GB and 32GB) and the display refresh rate is faster. The moment you sign into your Amazon account, all your books are automatically synchronized with the device and you can click on any of them and begin to read. Synchronizing with a wireless device is also easy. Amazon also did a great job of increasing the number of customization options on the device including a greater level of boldness gradation and font sizes, left align, and more typefaces. The intention of all of these options is to make the ebook look more like the traditional book. Is The Amazon Kindle Oasis Selling Like Wildfire? I wouldn’t say that. Amazon spokesperson pointed out that Kindle enjoys a rising year-over-year global sales but I will not bank on that. Amazon has a culture of keeping mute on sales record but data from other sources indicates that ebook sales are continuously on the decline. The price of the new Kindle Oasis is $250 (£230) for the 8 GB. Users who want the 32GB storage with the 3G connection will have to pay £320. The good news to all Kindle users from the 2013 Paperwhite to the newer versions is that all the improved customizations will also be available to them as software update.